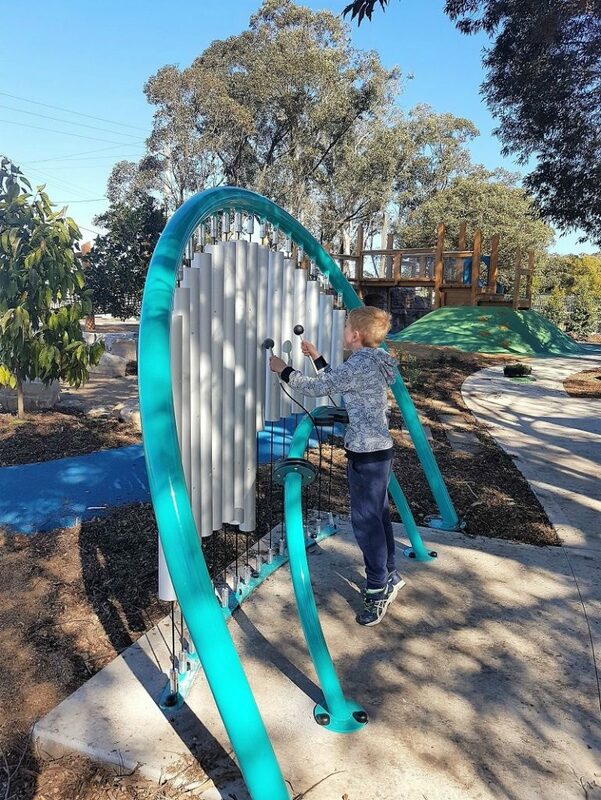 A great new playground at Governor Phillip Park in Windsor is open and it’s a goodie! Here’s a rundown of it. Governor Phillip Park runs along the Hawkebury River in Windsor, about two minutes’ drive from George St, the centre of Windsor. We don’t know the area well but it’s easy to find with the help of Google Maps. It’s a very pretty spot and it’s a lovely place to add a playground. This one suits the surroundings well. We love the natural wood and stone elements that blend in nicely with the landscape and river. 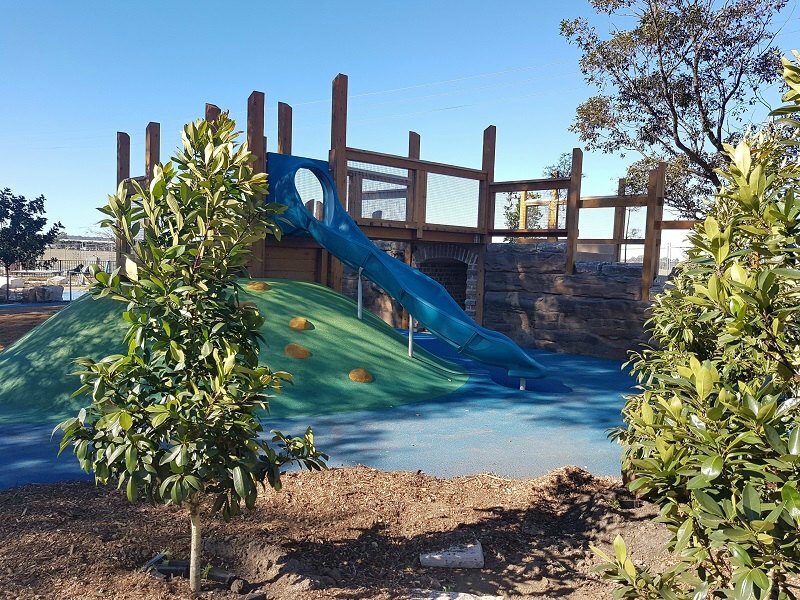 It’s also worth noting all the landscaping and plants that have been added – when we visited the plants were new and very small, so we hope they withstand the onslaught of kids! There’s a slide, small merry-go-round/carousel, bird’s nest swing and a cool fishnet tunnel – the first of it’s kind apparently. 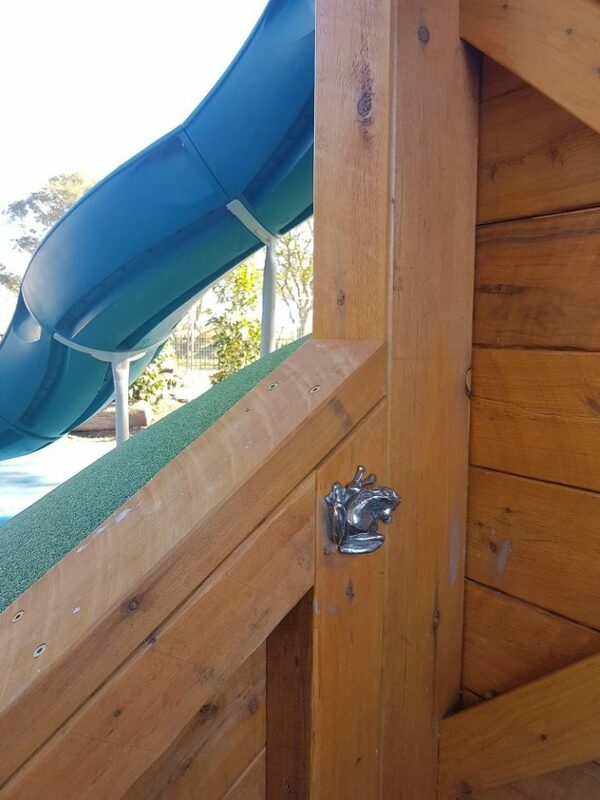 But it’s the few extras we really like such as the cool small metal creatures placed on the side of sandstone blocks or underneath the slide that kids can hunt for. There’s lots around so keep your eyes peeled! 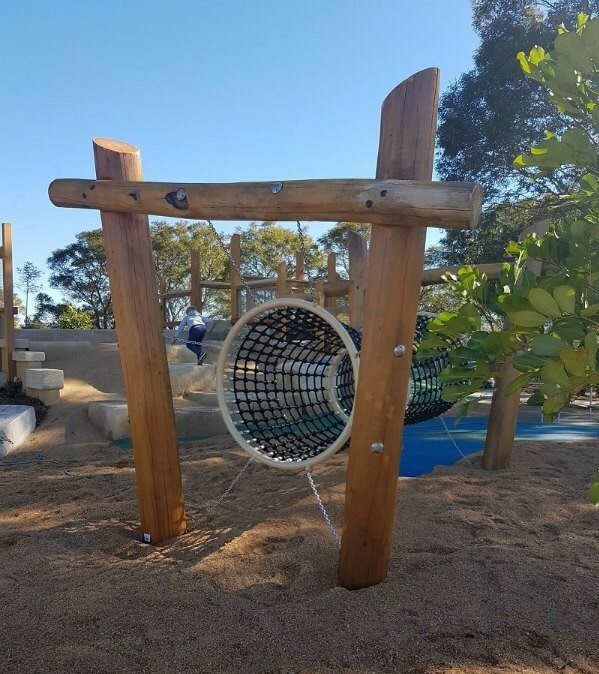 When exploring the playground we spotted a bat, lobster tail, crab and frog – there may be more to find! 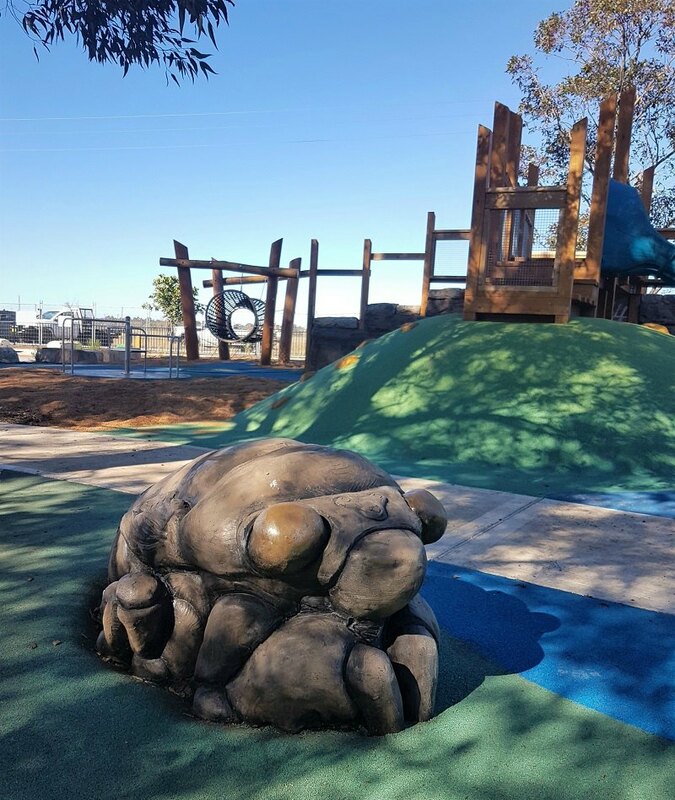 Continuing with the animal theme, there’s a huge lizard and 3 giant cicada sculptures which add another dimension to the playground and could aid imaginary play. And by these there are in-built trampolines. There’s a tunnel and a bridge to cross over too – again, this may spark little imaginations into action with a bit of castle play. There’s also some sensory play – we loved the giant chimes and there are also blackboards, however we wonder about the practicalities of these, and chalk, but let’s cross our fingers and see. And, we’ve saved the best for last. Drum roll please … there’s water play! 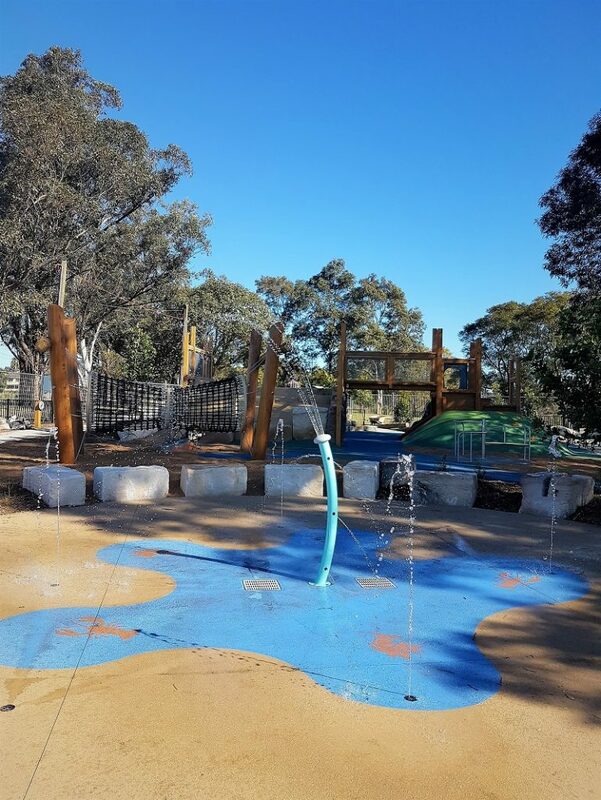 We know how popular a water play area can be and we also know it’s not cheap – so well done Hawkesbury City Council! We’re sure it will be a massive hit in summer! It does run all the time and there’s a button to turn it on. You may want to pack a spare change of clothes because even in winter it’s hard to convince little people to stay out of it – as we found out! The playground sits within a larger park by the river, so it’s a very pleasant spot for a picnic and you could also bring a ball to kick around. There are two bbqs in this larger space by the playground. The playground is fenced and there are toilets underneath a nearby boat club, about 80m away. There’s some shade from the trees and a very pleasant breeze comes off the river too. There’s mulch in parts of the playground, so if you have a phobia of it wear enclosed shoes. You can read more about visiting Windsor for the day here.